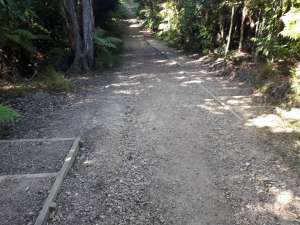 On a nice sunny day, there’s no better way to experience Waiheke than tramping through some of our beautiful native bush. 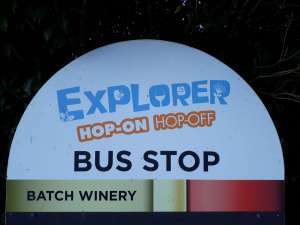 This pictorial guide shows you how to walk to Peacock Sky Vineyard from the #9 bus stop on Fullers Explorer Hop on Hop off bus service (outside the main entrance to Batch Winery). As you get off the bus you should find yourself facing this sign. 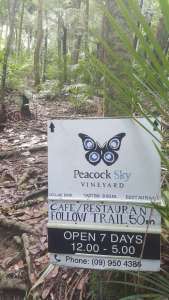 Look to your left and you will see a sign at ground level, walk around to the other side of the sign and you will see it points to The Cascades – that’s our first destination. 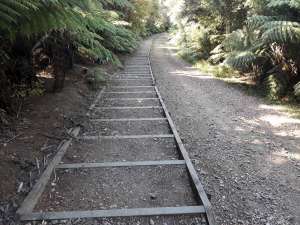 Walk along the big open track for a short while (60m, about 1 minute) and you will come to the top of some wooden steps. 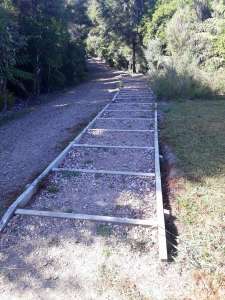 There are several sets of these with gaps in between, either on the left or right side of the track. 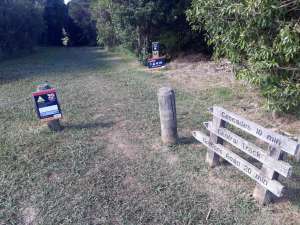 Eventually (370m, about 5 minutes) you will reach the bottom of the steps, and if you look to your left you will see this sign pointing along the main walking track. 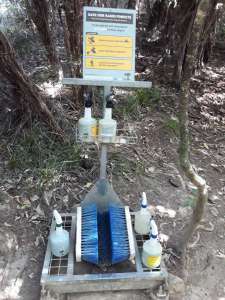 Just after the sign you’ll find this shoe cleaning station – it’s part of the efforts to fight Kauri dieback disease. 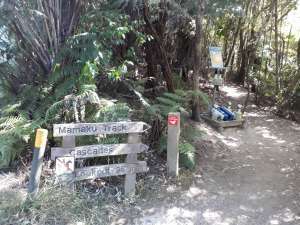 Continue along the trail (60m, about 1 minute) and you will find this sign showing you the loop track that goes to The Cascades. 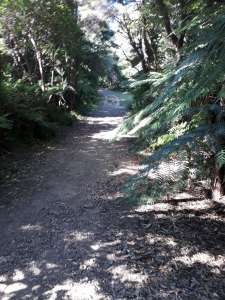 It’s a nice detour if you have time, just a couple of hundred metres but includes quite a few steps so allow 5-10 minutes. 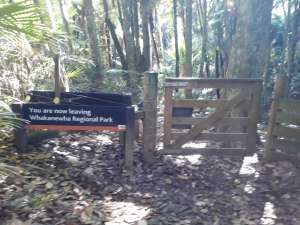 Continue along the Mamaku track (290m, about 4 minutes) and you will come to the gate marking the boundary of Whakanewha Regional Park. It’s not locked – just unhook the latch and re-attach after you’ve gone through. 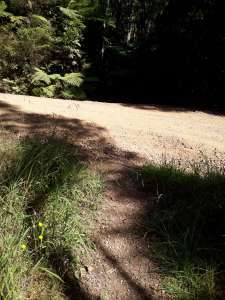 Shortly after leaving the park (160m, about 3 minutes) the trail crosses a gravel road – just go straight across, but watch out for traffic! Keep following the trail and you’ll notice it’s marked by green and yellow posts. You’ll encounter one after 30m, 50m, 100m, and so on—keep following these posts! 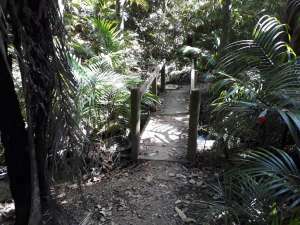 Soon (130m, about 2 minutes) you will reach the first of two wooden bridges, go over the bridge and keep following the trail. 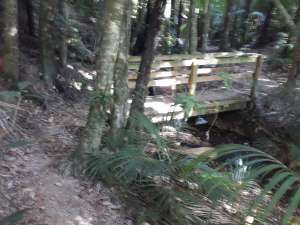 Next (210m, about 3 minutes), cross the second wooden bridge. 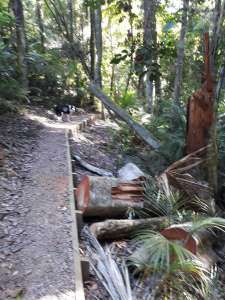 After a little while (350m, about 5 minutes) you’ll pass the remains of quite a large fallen tree. 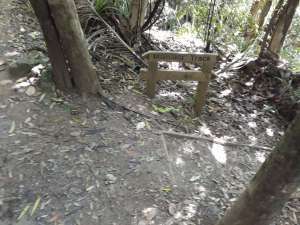 About 140m (roughly 2 minutes) after the fallen tree, you should see this sign on your left. You’re almost there now! Head up the hill on the little side track. 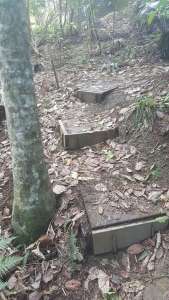 After about 20m you’ll find some simple steps. Follow these around to your right. 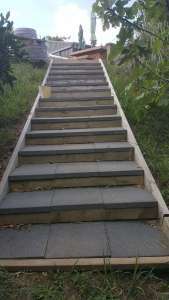 After another 10m you’ll find this staircase. You’ll emerge in our outdoor seating area just outside the tasting room and restaurant.